From the Camp Fire to the Kitchen Table: a six part blog series on leadership and change practice. In part one of the From the Camp Fire to the Kitchen Table blog series, we looked at where leadership began: around the campfire. We compared the campfire model to many current leadership models that are about self promotion, individualism, transmitting information and the short term. In part two, we will look at the skills the leaders of tomorrow will need. In 2013, social scientist John Gerzema asked 64,000 people in 13 countries to identify the qualities they want in their leaders. What they found is that we want tomorrow’s leaders to be Flexible, Selfless and Ready to Collaborate. This is far closer to the campfire vision of leadership than that of the Charlton Heston image in part one: the mostly old, mostly white, mostly male standing on a hill telling everyone else what to do. A flexible leader is an action researcher, who constantly improves processes and adjusts goals on the run. When you are flexible, you are open to new ideas. You’re open to changing the process and the expected outcomes in order to achieve change. A flexible leader recognises strengths in others and goes with them. A flexible leader responds to change like a jazz musician. Have you met a leader who is ready to collaborate? One who, instead of lecturing from the stage, is ready to sit in a circle with the others? To recognise the strengths of others and to help create a shared vision or plan? One with sleeves rolled up ready to lift the wheelbarrow and plant the garden together? One who is ready to share credit? One who understands what makes people tick? A collaborative leader is a Guide Beside, not a Sage on Stage. I heard a story during the recent ten year anniversary of the Black Saturday bushfires. The storyteller was talking about how, in the immediate aftermath of the fire, the word “resilience” was being bandied about far too much and people were sitting in far too many meetings. After a few days, a local came forward and suggested that instead of talking, they should all do something together. So, the locals came together and began building a memorial garden. As they worked together, they talked and remembered and worked through many of the things they needed to talk about. The power of collaborating on tangible things cannot be underestimated. Be Creative: Find new ways, new paths, new ideas, new possibilities, new imaginings. As I said at the beginning of Part 1 of this blog series: Our world has reached the tipping point. Nature is breaking. The economy is breaking. Society is breaking. Politics is breaking. Old stories and myths about how society works have broken. All of the answers will not be found by looking backwards. Be Connected: With people, with neighbours, with friends, with community and with nature. Conversations are the bedrock of culture. Change only comes about when we’re with the other people. And remember that we are connected to nature. We are intricately connected to and utterly depended on every living system. As Janine Benyus, author of Biomimicry says, “Nature is our greatest teacher because she has already solved the problems we are working on.” Connecting with others and nature will create better change. Be Confucius: Confucius said, “Wheresoever you go, go with all your heart.” Find the sweet spot between what you love and what you’re good at: what Ken Robinson calls your Element. Make a difference there. We need poets and engineers and teachers and lawyers and more working on a positive future. What skills can you offer? I always back this up with a further piece of advice: The journey to a regenerative future is not rocket science, it’s a three year old. A three year old is always asking, “Why?” A three year old is always digging for more knowledge. A three year old playfully tries and tries and tries until they learn how to do something. A three year old wants the same book read again and again and again until they fully understand. A three year old will climb up high and jump off and trust that they will land safely. If a door is left open, a three year old will bolt outside and explore. A three year old will take great joy in stopping to celebrate with a biscuit. A three year old will make mistakes, and then go back to try again. And when a three year old is exhausted they go and rest in a beanbag. And if they don’t rest, they will have a tantrum. A three year old loves people and nature so deeply and so naturally it sometimes hurts to watch it. We adults could take much wisdom from a three year old. All of these things are crucial leading change. We grown ups in the Western world are far too focused on outcomes and box ticking and reporting. As Einstein said, “Imagination is more important than knowledge.” We need to focus instead on being curious, creative, connected, Confucius leaders of change. 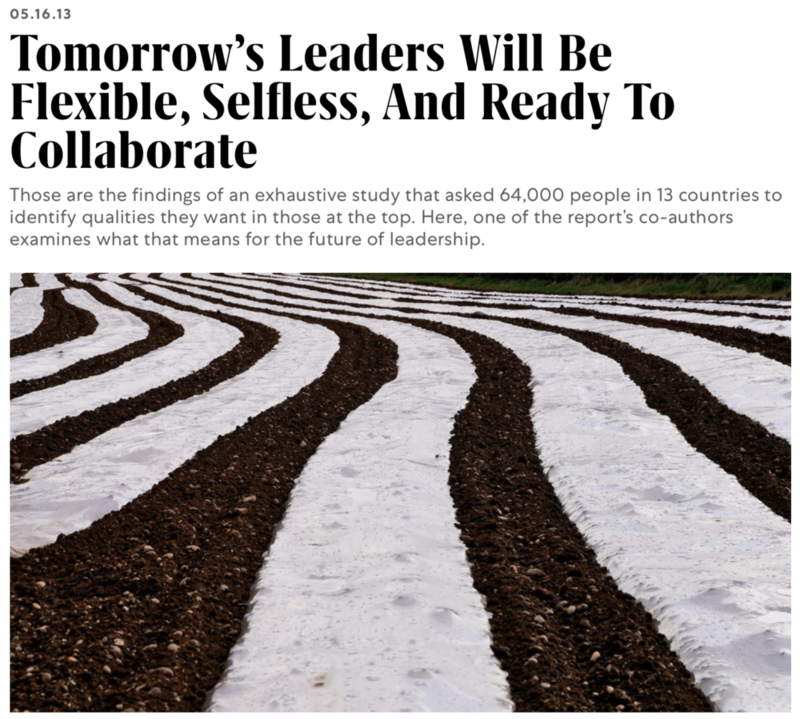 So tomorrow’s leaders will be flexible, selfless and ready to collaborate. They will be curious, creative, connected and passionate. They will practice the deep wisdom of three year olds and will make sure that everyone around them is having fun on the journey. In next week’s blog, part 3 - Leadership and the Self, I’ll be looking at what makes us as individuals become better leaders. There will be wisdom from Brene Brown, Malala Yousafzai, Cathy Freeman, Ken Robinson, Lao Tzu and David Greybeard the Chimpanzee. But don’t think I’m going to focus for long on the self! We belong with the others and that will be part 4. February 13, 2019 by Ian McBurney. 40 Cards For Building Conversations Towards Sustainability: order today! 40 intriguing statements • 40 conversation-starting questions • 40 inspiring quotes ... and an on-line booklet.